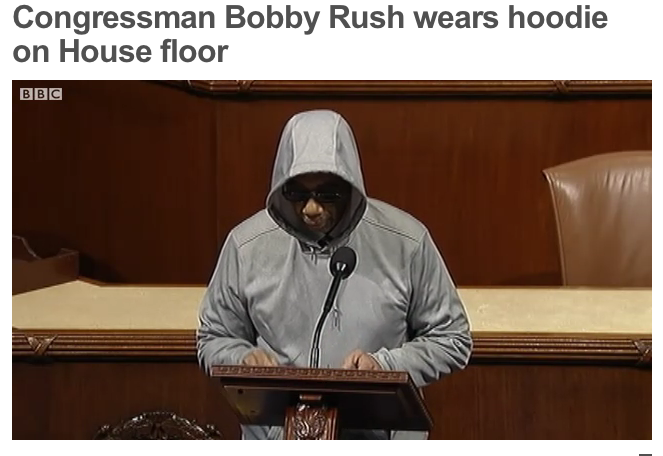 A Democratic Congressman, Bobby Rush, has put on a hooded sweatshirt on the floor of the House of Representatives as he discussed racial profiling. The Illinois representative donned the hoodie as he spoke about the death of an unarmed black teenager, Trayvon Martin, who was shot dead in a gated community in Sanford, Florida. A neighbourhood watchman who opened fire said the 17-year-old, who was wearing a hooded sweatshirt, had looked suspicious.